Breeder of third generation Minuet cats, the pride of cat lovers, and the kings and queens of the cat world. So you’re thinking of getting a Minuet kitten. That’s fantastic. ou are in for a treat. Minuets are wonderful cats that love their human family and bring a tremendous amount of joy to you. Hopefully, you have done your research on the breed and know that you are committed to taking on the responsibility of caring for such a treasure. If you want to learn more about Minuets, check out the information I’ve compiled about the breed here. If you are interested in showing your Minuet, check out our Conformation Standards page. We hope we can help you find the right cat for either you or your family. If we don’t have one at the time you’re ready, we can help you look for one from another reputable breeder. If you need to know anything about Minuets, it is that they are not solely “dwarf” cats. They come in two versions: regular legs and short legs. Getting a kitten is a big deal and can be a little daunting. We would like to make it as pleasant an experience as possible. Communications is key in that respect, and we encourage you to contact us with any questions you have about the process. We are committed to producing the best third generation Napoleons out there, which means that our kittens will have parents and grandparents that are nothing but Minuets. At this time, it is still acceptable to use Munchkins and the Persian breed group to produce Minuets, and this is completely fine. Eventually, though, the standards will require that only Minuets to Minuets pairing will be acceptable. Our breeding program is modeled that way. Since our cats are second-generation Minuets, all their kittens will be third-generation Minuets. To get a kitten from Tiny Lions Napoleons, we do not require a deposit to get on a waiting list. However, once you wish to reserve a kitten from a litter, we require a non-refundable deposit ($100 for a nonstandard and $200 for a standard) to put your name on that kitten. * All people on the waiting list will be able to select from available kittens; and although you may be low on the list, it is possible that you will still get a kitten. We choose the best families for our kittens, not on a first-come, first-serve basis. 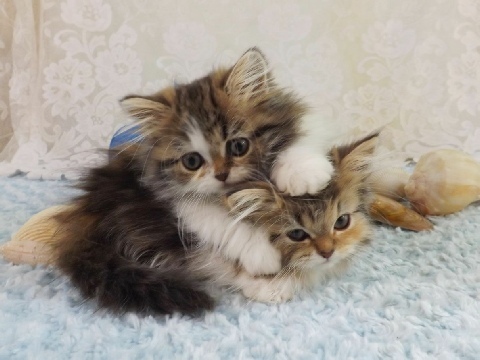 Please be aware that we will NEVER sell our kittens to brokers. If you are a broker, do not even inquire. We vet people on our waiting list to ensure that our kittens go to their forever homes directly from us. Nonstandard Minuets (long legs): starting at $700 (including altering and shots and much more). Long leg Minuets have the same beautiful doll-like Persian look and sweet temperaments as their short leg counterparts and are very desirable cats. The cost of each kitten is dependent on color, lineage, and conformation standards. Cats that display show quality traits will run a little higher. We prefer to sell only kittens as pets, but we will consider selling quality kittens to a breeder if we agree with their breeding program. Such a breeding program must include their cats being family members. Otherwise, our kittens will be spayed or neutered before going home to their new family. Learn more about getting a kitten from us on our Tiny Lions Kittens page. You’ll see everything you get with your kitten. Show Kittens: If you intend to show a kitten in TICA or any other cat association, you must indicate this to us. All our kittens go home altered, unless requested by the purchaser for either breeding or showing in championship classes. A kitten that is meant for showing in championship will not be altered and will come with an additional $500 fee. Please understand that the registration will specifically state that the cat is ALLOWED to show but is NOT ALLOWED for breeding. Any kittens bred from this cat will not be registered in TICA. If we learn that you are breeding a cat from us that has not been altered because you wish to show it in championship class and we have not approved it for breeding, we will file a formal complaint with TICA and pursue disciplinary action. We only sell our kittens for breeding to programs that we approve. Our selling contract will specifically state what rights are being sold with the kitten. Cats that will show in Alter Class will not carry the additional show fee and can be purchased at the pet price; however, they be altered they go home. If you wish to get on a waiting list, you will have to fill out a questionnaire. Very few breeders require this, but we are concerned about where our kittens go after they leave us. Minuets are very resilient and adaptable cats, and having other pets in the house will not prohibit you from getting a kitten from us. The questionnaire will help us understand your living situation, as well as to give you a chance to reflect on the consequences of bringing a Minuet into your home. We can review your answers and give advice on how to incorporate your new kitten into your family. You can also find helpful suggestions on our Advice page in the above menu. *If a kitten you have picked and placed a deposit on doesn’t thrive to be sent home, you will be given the option of having your deposit refunded or chose another kitten from an available litter. If there is no litter available at this time and you choose to wait for one, you will be given first choice in the next available litter. International buyers: Please see information specific to purchasing a kitten from us if you are from out of the United States. You will find that information here. Conversely, there are good breeders trying to support the standards of Minuets. Do your research. Contact TICA and CFF for advice and direction. When you find a breeder, speak to them. If they don’t answer your questions, be wary of them. Many of the so-called breeders I tried to contact in search of my first Minuets didn’t even return my calls or emails. Some turned out to be spammers trying to collect email addresses. Always be on alert for a breeder who doesn’t have a web site, or at least a Facebook page. Look for someone who provides a phone number, as well as an email address. If no phone number is provided on a web site, expect a response back by email in a timely fashion. Getting a Minuet is not cheap and should never be an impulse buy. The most likely scenario is that you will have to wait for your kitten to reach the age where he can be sent to his new family (usually 12 weeks). More often than not, you’ll have to get on a waiting list. You will probably have to put a deposit down to ensure that a kitten is reserved for you. This is normal practice for reputable breeders, who want to ensure that you are committed to taking care of a Minuet. When dealing with a reputable breeder, you should expect to have good communication with them about their cats and their cattery. You should be able to review a kitten’s pedigree, or at least its parents’ pedigree. 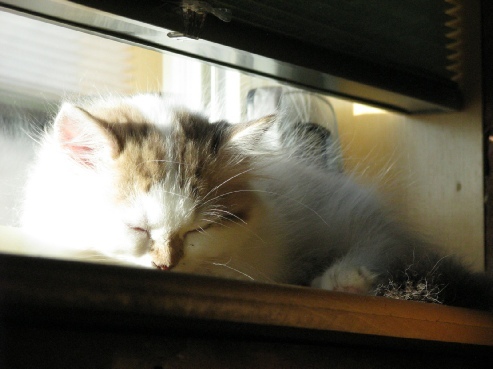 The breeder should provide health certificates and immunizations for the kitten before it goes home with you. This is the least you should expect. However, a good breeder will also provide photos of your kitten’s development and updates on his progress as you wait for it to mature. This was the most exciting part of the waiting process when I was looking for my girls. Minuets are a relatively new breed and they haven’t flooded the market yet. We find that fortunate, because once unscrupulous breeders get it in their mind to start mass producing them, the breed will suffer. It is important to remember that responsible breeders are interested in developing the standardized traits into new generations of cats to keep the breed pure. Be prepared to look for a good breeder. Don’t look on Craigslist for a Minuet and expect to find a purebred, healthy kitten. Take it from me, who spent several months looking for my first Minuets, there are several phony breeders out there. You can read our experience with fraudulent breeders here. Disclaimer required by TICA for the use of their logo: This cattery has NOT been inspected by and is not endorsed by The International Cat Association, Inc.